Relieved to finally have the public natural gas project for Tunkhannock underway are (above, from left) PA Department of Community & Economic Development executive secretary Scott Dunkleberger, Wyoming County commissioner Tom Henry, Wyoming County Chamber of Commerce president Gina Suydam, and UGI director of business development Don Brominski. 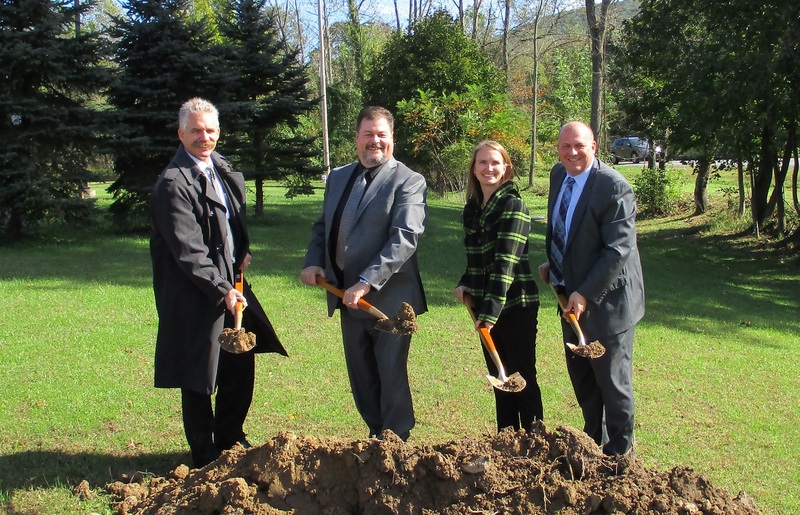 Ground was ceremoniously broken on Oct. 16 for the first phase of a public natural gas service project in Tunkhannock. 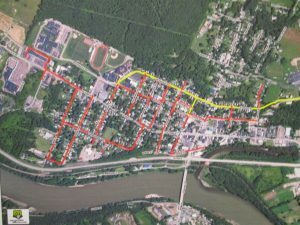 UGI Utilities is overseeing the project, which will begin with the simultaneous construction of a gate station in Tunkhannock Township to tap a Williams line and the installation of a trunk into the borough of Tunkhannock. The initiative is indicative of efforts to expand gas service in the region, including more communities in Susquehanna County. Prior to putting their shovels in the dirt outside the Wyoming County Emergency Operations Center, UGI director of business development Don Brominski, PA Department of Community & Economic Development (DCED) secretary Scott Dunkleberger, Wyoming County Chamber of Commerce president Gina Suydam, and Wyoming County Commissioner Tom Henry shared some comments with a mixed audience of public officials, company representatives, and Tunkhannock residents. Suydam recalled years of planning and meetings with corporate officials and municipal leaders and credited Brominski for giving her hope on days when it seemed that the project might never come to fruition. 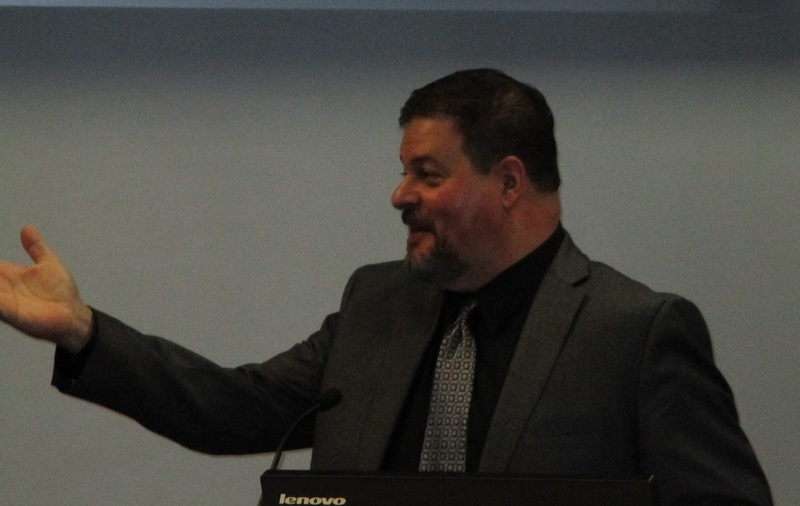 The county commissioners gave the reigns to the Chamber and provided some start-up funds that were crucial to acquiring a $1-million Pipeline Investment Program (PIPE) grant from the Financing Authority, according to Suydam. 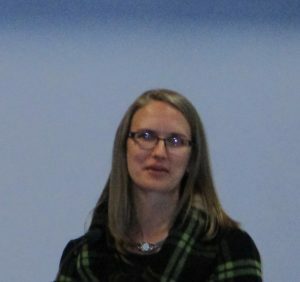 “Without that initial investment,” she said of the county’s contribution, “the state would not have looked on this project favorably.” The successful transmission of natural gas to Montrose and conversion by many businesses and residents there also helped UGI conclude that the Tunkhannock area would provide enough customers to justify the cost of installation. As in Susquehanna County, Cabot Oil & Gas will supply the commodity. It was hoped and all but assumed initially that the Tunkhannock School District would become the end user with the new trunk line proposed to run directly to the campus. Opposition by some school board members to natural gas in general and an assumption by others that the district should be better compensated has literally thrown up a roadblock at the west end of Harrison Street. Earlier on Oct. 16, Commissioner Henry stated in a public meeting, “I don’t know what the problem is there,” noting that UGI has asked the district only to pay for what they save from a conversion to natural gas from electric heating until the installation is paid off. Both the Elk Lake and Montrose school districts in Susquehanna County reported savings within two years of their respective conversions. Suydam struck a more conciliatory tone by thanking the Tunkhannock School District for maintaining an open dialogue on the topic. As Brominski fielded questions from concerned citizens, he assured them that UGI will take responsibility for all impacts and inconveniences in Tunkhannock. When asked why it was so crucial to start the project just as winter sets in, Brominski noted that it was hoped that the project would be started even earlier. “We don’t want to wait until next spring. We’d rather have people be able to convert as soon as possible,” he stated, adding that Phase II of the project is on tap for next summer. Meanwhile, in Susquehanna County, Leatherstocking Gas Company (LGC) is working to extend a line down State Route 29 to Ellsworth Drive to provide natural gas to the Susquehanna County Correctional Facility, Taylor Rental and other businesses in the growing industrial park there. After that, says Russ Miller, LGC’s vice president of energy supply and business development, the goals are to start closing some gaps. “We already have gas in Dimock to the Elk Lake School District and to residents along that line,” he related. “There is pretty good potential for customer growth in South Montrose as well in 2019-20. The objective is to expand the Bridgewater System that serves Montrose into those areas.” On Oct. 22, LGC applied for a grant to extend natural gas service to Wyalusing in Bradford County. LGI is hoping to add nearly 100 customers in the next year and has posted information at www.leatherstocking.com about USDA funding and appliance leasing to help off-set the hookup cost. “We’ve found that running the gas in front of homes doesn’t necessarily mean they can afford to hook up right away,” said Miller. If the comparative costs of heating oil and propane aren’t convincing enough, he hopes that the incentives offered online will make the conversion more economical and help customers recover their costs quickly. 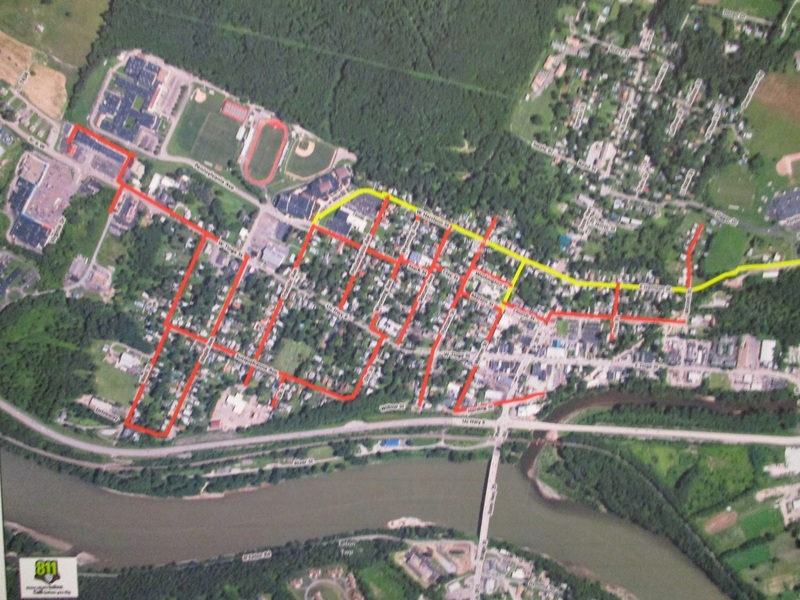 Phase I of the UGI gas project in Tunkhannock is shown in yellow on this rendering. Phase II, expected to start next summer, is shown in red.